Passaic County located in the upper northern part of New Jersey is known for its diversified population in a suburban setting making it one of the more popular places for people to live. If you are a resident homeowner in Passaic County and looking for expert HVAC services., choose Bloomfield Cooling, Heating & Electric, Inc. We have been servicing the area of Passaic, Essex, Hudson and Bergen Counties for over 27 years. Bloomfield, Cooling, Heating & Electric, Inc. is fully licensed and insured. We are able to install new air conditioning systems and repair or maintain existing air conditioning systems. We also sell and install the popular Ductless Mitsubishi Air Conditioning/heating systems for those who have a unique space requirement that is not conducive to all the ducting that traditional central AC units might require. Our technicians are all certified and factory trained to work on most brands of air conditioning systems and factory authorized by Carrier and Mitsubishi. Our techs attend continuing education to keep up on the new requirements and the new systems that are being manufactured. Our Electricians are all licensed by the State of New Jersey to provide the necessary wiring to either upgrade or install a new air conditioning system. We offer up front pricing with no hidden fees or surprises. Currently you can take advantage of a special offering to save $500.00 on any complete air conditioning system installed. For those who qualify we can also offer a special no interest financing program. We have an air conditioning tune-up special maintenance program for $89.99, a regular value of $ 149.99 that will keep your unit at peak performance. We highly recommend maintaining your air conditioning system. It helps to extend the life of the system and insures that the system runs more efficiently, saving you energy costs and repair costs. Bloomfield Cooling, Heating & Electric, Inc. believes in providing affordable services and products. We believe in educating our customers as part of our customer service. We are family owned and operated and take pride in our superior customer service and our repeat customers who never hesitate to refer us to family and friends. Our dedication to providing excellent customer service has been acknowledged by Angie’s List with their Super Service Award in three categories HVAC, Generator and Electrical for ten years in a row. 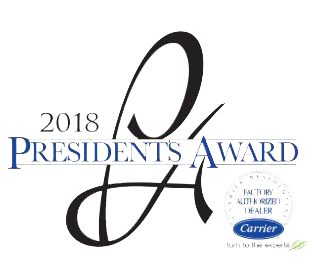 For two years Suburban Essex readers have honored us with a gold medal by their Reader’s Choice Awards as BEST HVAC Contractor and most recently, we’ve received the President’s Award by Carrier. We are very grateful for our dedicated customer base that has grown with us over the years.